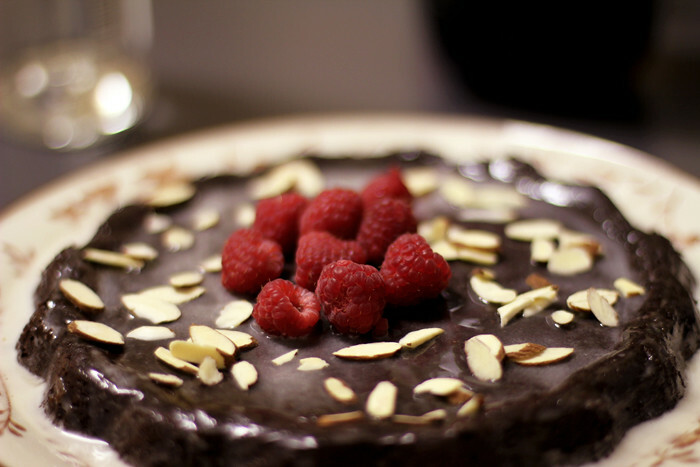 Kate Bullen: Flourless chocolate cake. Made this flourless chocolate cake recipe for my housemate Michael's birthday (via Martha Stewart). I modified this recipe slightly; I didn't have that much chocolate so I used some cocoa powder, substituted a couple eggs for sour cream, and made a glaze/added the trimmings. Was pretty tasty--but I wish we had let it set longer before digging in, and it really could have used some vanilla ice cream on the side! Next time.